Captain Marvel is an upcoming American superhero film based on the Marvel Comics character Carol Danvers / Captain Marvel. Produced by Marvel Studiosand distributed by Walt Disney Studios Motion Pictures, it is intended to be the twenty-first film in the Marvel Cinematic Universe (MCU). The film is written and directed by Anna Boden and Ryan Fleck, with Meg LeFauve, Nicole Perlman, Geneva Robertson-Dworet, Liz Flahive, and Carly Mensch also contributing to the screenplay. Brie Larson stars in the title role, alongside Samuel L. Jackson, Ben Mendelsohn, Djimon Hounsou, Lee Pace, Lashana Lynch, Gemma Chan, Algenis Perez Soto, Rune Temte, Mckenna Grace, Clark Gregg, and Jude Law. 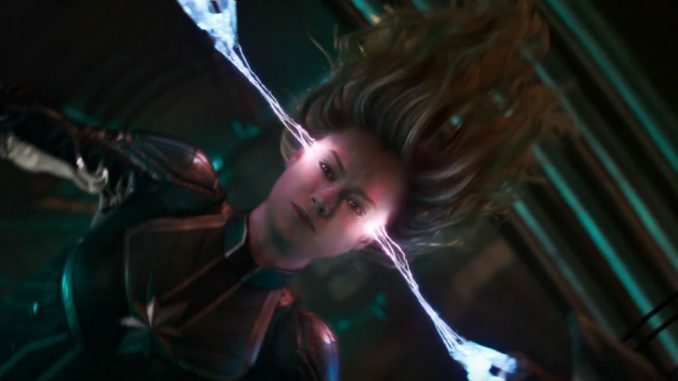 Set in the 1990s, the story follows Danvers as she becomes Captain Marvel after the Earth is caught in the center of an intergalactic conflict between two alien worlds. A film based on Carol Danvers has been in development at Marvel Studios since as early as May 2013. A release date was first set in October 2014, and Perlman and LeFauve were hired as a writing team the following April after submitting separate takes on the character. Larson’s casting was announced at the 2016 San Diego Comic-Con International, making it Marvel Studios’ first female-led solo film. Boden and Fleck were brought on board to direct in April 2017, and Robertson-Dworet soon took over scripting duties, the story of which borrows elements from the 1971 “Kree–Skrull War” comic book storyline. Location filming began in January 2018, with principal photography beginning that March, taking place in California and Louisiana. By the start of filming, the remainder of the cast was filled out as were the additional screenwriters. Filming concluded in July 2018.